After the television network HGTV purchased the famous home that was used for exterior shots during the filming of The Brady Bunch, neighbors weren’t happy that a potential television production was coming into the area. According to reports from TMZ, HGTV has no plans of not moving forward with their plans for the house and have gotten in touch with the neighbors, looking to make peace through cookies. TMZ was given access to a letter that was sent to neighbors that lived around the house, which is located in the San Fernando Valley near Los Angeles. The letter comes from the production company Lando Entertainment, who will be making the show for HGTV. In the letter, Lando Entertainment details big plans for the house, as they create a television show based on the remodeling project. Early plans reveal that after purchasing the house for more than $3 million, the network has commissioned a show that seeks to heavily expand the home, taking the back walls off and changing the size from 2,400 square feet to more than 6,000 square feet. Lando Entertainment sought to make the most positive impression they possibly could with the gesture, attaching the letter to a fresh batch of cookies from local bakery Susie Cakes. 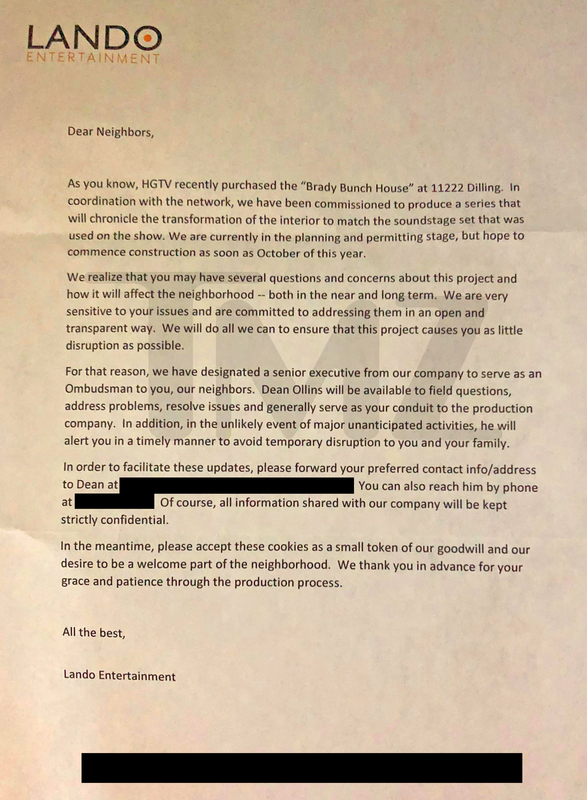 The letter and cookies arrived as word has gotten out that neighbors aren’t pleased with the prospect of a television production moving into the neighborhood, as well as the construction noise, street congestion, traffic, rubberneckers, and HGTV production trucks that all come with it. One neighbor told TMZ that the last time a production was in the area, an entire street was completely shut down, a nightmare scenario for residents. While Lando Entertainment has no plans to halt production, they are willing to do what it takes to keep everyone happy. Lando Entertainment has big plans for the house, as it seeks to remodel the interior and recreate the original soundstage that The Brady Bunch was filmed on, which means a lot of construction and possibly heavy disruption of the surrounding neighbors lives. Lando Entertainment made it clear that everyone will be given word whenever any of the big changes to the house occur.